For over 150 years. 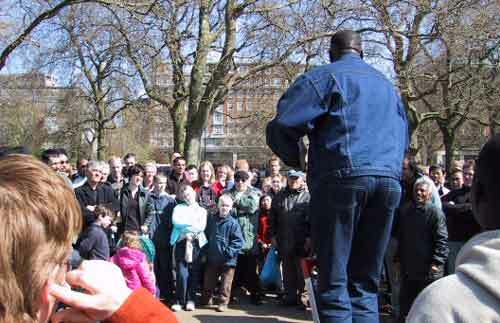 Speaker's Corner has been one of London's most unique and eccentric attractions. Speaker's Corner was established to create a venue where people would be allowed to speak freely. Here, every Sunday people stand on a soap box and proclaim their views on political, religious or other items, sometimes interrupted and challenged by their audience. Another nice Syrian blog! Good luck Dina. Good job sis :) Keep it up! Wow never heard of this corner before. So cool, there should be one in every city (cheap tomatoes in the city too).